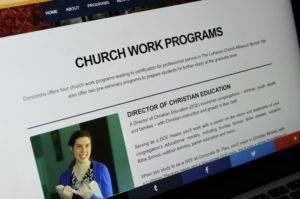 Students pursuing a degree at one of our LCMS colleges or seminaries in professional church work and current workers pursuing colloquy may apply for a scholarship grant from the LCMS Kansas District. The deadline for applications is June 1 of each year. The Scholarship Committee meets in July to review applications and determine grant awards. The amount of the grant is based on available funds and the number of applications that we receive. Grants are sent directly to the university/seminary. Funding for District scholarship grants comes from interest from scholarship endowments, designated gifts and bequests from congregations and individuals, and a portion of Ash Wednesday and workers installation offerings received from congregations. Financial aid is also available from the Lutheran Laymen’s League (LLL), Lutheran Women’s Missionary League (LWML), and St. John’s Alumni Association. Application links for these organizations are posted below. The Education Loan Repayment Committee awards education loan repayment grants to rostered synodical graduates (and those who have completed the colloquy program) working in a Kansas District congregation or school who have graduated within the last ten years. With the rising costs of education, many Kansas professional church workers can be saddled with large debts from student days. In 2018, 30 applicants received grants totaling $26,605 to assist in repaying their education loans. The combined total of their education debt was nearly $1.4 million. It is the policy of the LCMS Kansas District that grants be applied to any (educational) debt that rostered workers have incurred, whether in the form of federally subsidized loans, commercial loans or even credit card debt for books needed to enter ministry. The grant is sent directly to the lender to be applied to the principal to help reduce total indebtedness, not to make payments in advance or to reduce the amount of currently scheduled payments. The Committee reserves the right to determine what indebtedness is appropriate and what grants will be given, but seeks to keep its definition of indebtedness as wide as possible. Not adhering to this policy may jeopardize the worker’s opportunity to receive a grant. Grant applications are available in July each year. The Education Loan Repayment Committee meets in September to determine grant awards. For questions about Education Loan Repayment Grants, contact Shannon Oldham at shannon@kslcms.org. From MinistryFOCUS: MinistryFOCUS is a grassroots organization within The Lutheran Church—Missouri Synod (LCMS), founded to eliminate systemic barriers to ministry. The “Foundation for Called Workers” secured start-up funding, and MinistryFOCUS was founded in April 2013. MinistryFOCUS recognizes that individuals often assume educational loans in order to serve the Lord, and for some, such loans often distract from or even undermine their very purpose. MinistryFOCUS has established a loan repayment assistance program (LRAP) so that these servants of the Lord can focus more on ministry and less on money. Carry at least $20,000 in educational loans. For more information and LRAP applications go to http://ministryfocus.org/application/, or contact Ken@MinistryFOCUS.org. Applications for Ministry Focus Grants are typically due in December. I praise God for the financial aid you have given me. I am thrilled to be attending Concordia Nebraska. Thank you! Thank you very much for your continued support as I learn how to better serve God and others and to teach His children. I greatly and deeply appreciate your support. I can’t wait to see what God has in store! Thank you so much for the gift toward my student loans. Your thoughtfulness and generosity is greatly appreciated. It is a joy to serve God’s people! The loving assistance you offer to church workers in repaying student loans is truly something special. Thank you!